Visit us on Facebook! Don't forget to like & share our positngs with your friends. Our Mission is "to be a reflection of the Lord Jesus Christ through prayer, praise, and the proclamation of God's Word." We envision being a reflection of Jesus Christ by "...meeting the needs of every man, woman, and child, so they are free to experience the life-changing reality of Jesus Christ...no strings attached." Welcome to First United Methodist Church's website. We are excited that you are here and we hope this site gives you a glimpse into the life of our church. 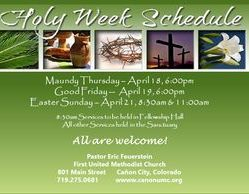 Our church is located on historic Main Street of downtown Cañon City, Colorado. We are excited about what God is doing in our church. Our church is an intergenerational church where children, youth, young adults, middle-aged and seniors worship and grow together. We take pride in creating a place that is welcoming, loving, and accepting of people in every stage of life and faith. We hope you know that no matter what has happened in your life, you are loved by God who longs to be in a relationship with you through Jesus Christ. If you have any questions, feel free to ask. If you want to know more, we'd love to get to know you, go ahead and contact us! Staff Email only - to contact us, please use the Contact Us button to the left of your screen.